News Archives - HiTECH Technologies, Inc. The latest addition to the 2000-SAN series is the ‘intelligent’ tank level transmitters (shell types) with extended flush mounted diaphragms. These instruments are manufactured specially for the U.S. food & dairy industries, and they are used in all insulated storage silos in U.S. food & dairy plants. All process connections from US competitors are available. Please contact us or check the new brochure for more information. A process with a continuous temperature of more than 100°C is a high temperature application. Below is a short reference guide for some of the many different options for measurement in high temperature applications. For more details or quotations, please contact us at info@hitechtech.com. Direct mounted transmitter with cooling element to protect sensor and electronics. Transmitter needs to be mounted at the side or bottom of the process (not on top because of the radiation heat). Applicable types 8000-SAN, 2000-SAN and 4000-SAN with various process connections. Use the transmitter with remote electronics (cable and remote sensor with HT cooling element). Special oil filling in the sensor part is needed. Sensor to be mounted at the side or bottom of the process (not on top because of the radiation heat). Applicable types 2000-SAN-Cable and 4000-SAN-Cable with various process connections. Some chemicals are more aggressive at higher temperatures. Besides the standard AISI 316, Klay can also supply diaphragms in Hastelloy C, Tantalum and Titanium for these kind of applications. The newest in the VLM line from Astech, the optical non-contact operating VLM 502 is a modern velocity and length measurement gauge with a small separated head unit. Due to its size, it works well within limited spaces to measure speed and length. 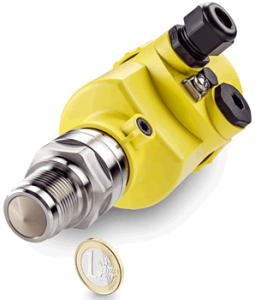 The VEGAPULS 69 provides accurate level measurement of bulk solids at distances up to 120 meters. This is possible because of its 79 GHz frequency. Its focused, reliable 79 GHz frequency ignores distractions like internal installations & buildup on the vessel wall, much like the VEGAPULS 64 does for liquids. As a result, the VEGAPULS 69 is more precise than other level measurement systems that operate at lower frequencies. HiTECH is proud to now carry the new radar from VEGA: the VEGAPULS 64. This is the first radar level sensor for liquids that operates at a frequency of 80 GHz. This new radar sensor is built for any size container, no matter how small. Due to the 80 GHz frequency, VEGAPULS 64 measurements are accurate and focused. It is not compromised by heating coils, other internal installations, condensation, or other buildup on the vessel walls because the 80 GHz radar beam only reflects from the product surface.